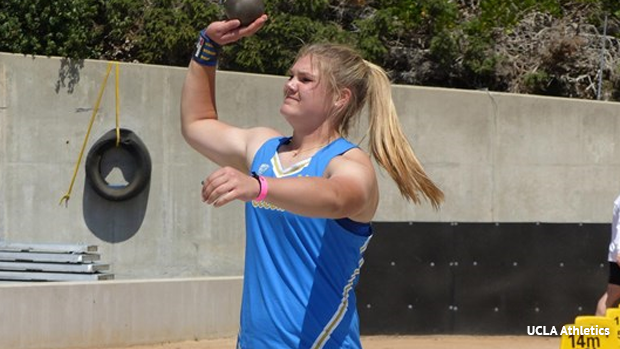 National high school record holder in the shot put Alyssa Wilson of UCLA, who graduated from Donovan Catholic in 2017, qualified in two events with the weight throw and shot put. For the shot she's coming in as the fourth seed with with a best of 58-02, that starts Friday night, and the weight throw she's thrown 72-11.25 and ranks sixth entering Saturday. University of Michigan's Andrew Liskowitz, who graduated Christian Brothers Academy in 2015, will be competing in the shot put as the 11th seed. His best of 64-06.5 came at the end of February when he won the Big 10 Indoor Championship. Hurdle extraordinaire Cory Poole, attending the University of Florida, runs out of the first prelim of the 60m hurdles on Friday night. He's the eight seed with a 7.73 from the end of January during the Razorback Invitational. He graduated from East Orange Campus in 2017 after a very successful career including a state record of 7.07 in the 55m hurdles. Eric Bethea of Indiana University enters the triple jump ranked ninth at 53-09. He graduated Piscataway Twp HS in 2015 and closed out his NJSIAA career with a bang winning both the long jump and triple jump at the Meet of Champions his senior year. Then there is Joe White of Georgetown University, DePaul Catholic 2014, who will be competing in the second heat of prelims Friday night. He comes in ranked fourth thanks to his seed time of 1:46.59.